Our profession is essential in helping transform lives and communities. Through multicultural understanding and resources, we are actively collaborating to make our planet a better place for everyone—from those in our neighborhoods to those in our global community. Take, for example, Los Angeles Public Library, which partners with the city to provide patrons access to free classes to obtain a high school diploma. Or librarians in Alaska, who have partnered with the state to use devices to identify bats in danger of extinction and help preserve the biodiversity of the region. As many of us already know, libraries drive change. They have the power to provide access to information that can assist people in better educating themselves to reach their goals, secure jobs, increase income, maintain health, and even learn about water systems and farming. These can contribute to increasing education and decreasing hunger in their communities. They provide the information and tools needed to help manage our oceans and develop new ways of producing sustainable energy. From education to preservation of our planet, libraries and library workers are contributing to save our communities. But we are not doing it alone. Library schools, community organizations, and other agencies are working with us to develop innovative services that meet the changing needs of localities, at the same time supporting sustainable development for the world’s economies and societies. 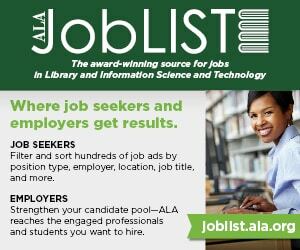 The American Library Association (ALA) and its divisions are developing programs and resources to assist library workers in supporting diverse populations. For instance, the University of Delaware Library in Newark followed an initiative from the Association of College and Research Libraries to increase financial literacy instruction to help students manage their money. 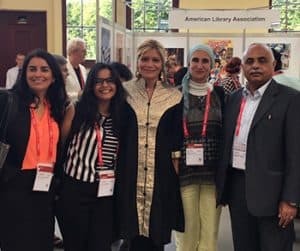 ALA President Loida Garcia-Febo (center) with library colleagues from around the world, at the 2017 International Federation of Library Associations and Institutions conference. Public libraries are providing reliable resources and support programs on health and wellness through the Promoting Healthy Communities initiative from the Public Library Association and the National Network of Libraries of Medicine. 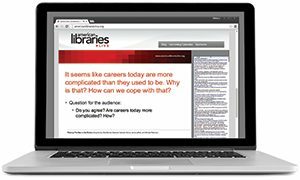 The American Association of School Librarians offers a variety of online courses designed to make librarians leaders in their schools and communities. 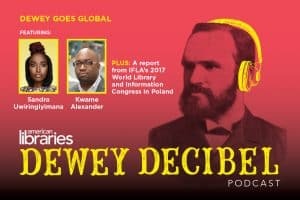 This year, I’ll formally include ALA’s longstanding commitments with different countries into a Global Library Tour to bring my advocacy campaign, Libraries = Strong Communities, to places such as the Guadalajara Book Fair, Sharjah International Book Fair, the European Union Parliament, and the German Library Association conference. Others will be added as we continue to coordinate with ALA staff. Each one of us must continue to collaborate to help save our world—both near and far. We are in this together.